Oh my! What a gorgeous, sunny weekend we've had. Much too nice to stay indoors. We shoveled and dug and weeded. Pulled and transplanted. Mowed and trimmed. And at the end of the day - we ached with the good kind of ache that lets you lie in bed and drift off to sleep. The water on the tulips came from a hose, not from the sky. The bottom photo of the middle column is of a tulip centre, as is the one on the right. They are from the same sort of tulip bulb, but look at the difference. One creamy monotone, the other high contrast. Fascinating. Your tulips are pretty. Have a great week! It was 'the nicest, sweetest day'! Sunshine and beauty all around...Palm Sunday, 2014! I love your unique, creamy-coloured tulips. Oh there's nothing quite like that tiredness after a 'day' in the garden - satisfying! Your tulips are beautiful. I particularly love the photo on the bottom right with the sunlight and water droplets - very pretty. How lovely that Winter is now behind you Lorrie and you can enjoy being outside in the fresh air without too many layers of warm clothes! Such a lovely variety of tulips you have. 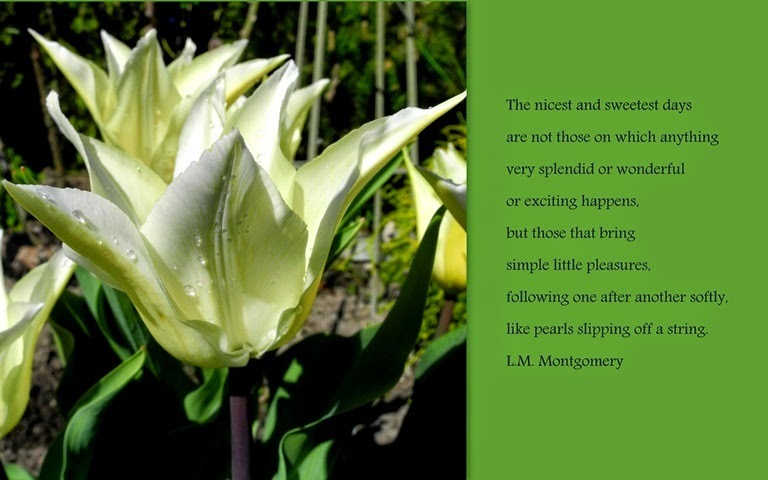 The colour is like butter and the more pointed petals make them quite elegant. Sunny here over the weekend, but very windy, so not a lot got done in the garden. My daughter was in Vancouver during the weekend and told me what lovely weather they had. Sweet tulips and I love them too. I love these pretty tulips, they look a little different than the tulips I am used to seeing. Beautiful images, have a happy week! We too knew that body ache this weekend. Time to put the veggies in the garden and other outdoor things! Good feeling! Lovely! None of my tulips are blooming yet, but I am eager for them to bloom! I love the Montgomery quote too. So true, isn't it? 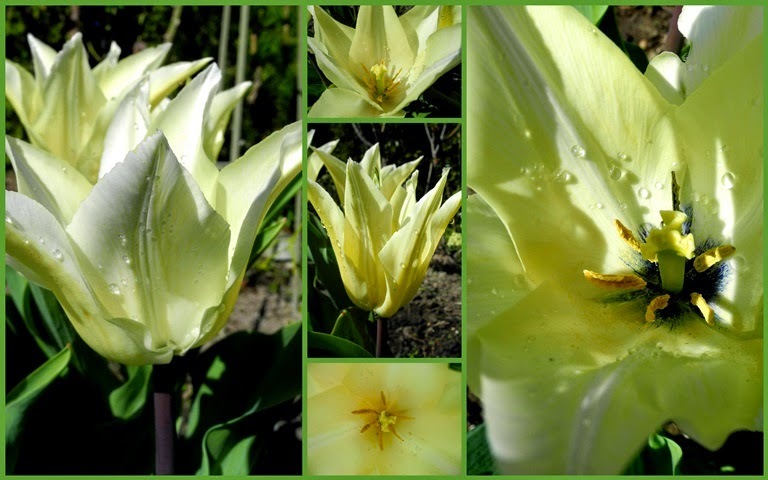 Gorgeous photos of this beautiful tulip. What a pretty variety. And how nice you can be working in the gardens and doing lawns. It's a good kind of tired after a day of yard work. Have a wonderful week. We enjoyed that kind of day on Saturday. Glad you enjoyed your outdoor work! I have to admit I'm still aching a wee bit. Have a great week. Your tulips in the sun shine ever so brightly after such great TLC!! Yes, there's something about working hard in one's garden that makes those aches and pains just a little more bearable. Those tulips are do delicate and pretty. Doesn't it feel so good to get out in the yard! These creamy tulips are just spectacular. Yes, it was a lovely sunshiny weekend! Definitely a time for being outdoors. It was the perfect gardening weekend. We went to bed with that same ache. Oooooo....lovely, lovely! And I do like that L.M. Montgomery saying. I think it's one of my favourites, thanks for reminding me of it. Wonderful description of a working weekend. That tulip is stunning. So much variety in tulips, of course, and that one is quite special. They are so beautiful...and such a shade of creamy green it makes me swoon. Gorgeous. Loving the green hue these tulips have. These are such gorgeous type of tulips..I love the pointy petals! Beautiful photos of your tulips, Lorrie! How I'm looking forward to warmer days and time to be in the garden!